Growing a vegetable garden can a rewarding pursuit. It is easy to grow fresh produce in whatever space you have available. Growing your own vegetables is not just fun, it is a good way to get fresh air and exercise, save on your grocery bill and experience a wider variety of tasty, wholesome foods. 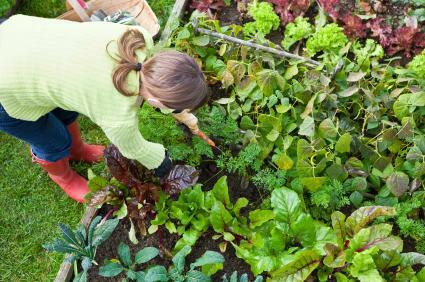 You do not need a big farm or even a large garden plot to grow vegetables. It is possible to grow a wide range of vegetables in raised beds, or even containers, which is a good idea if you have soil that is extremely hard to work with or very poor in nutrients. Growing vegetables vertically also allows you to an abundant harvest in very little space. It is important to pick the garden plan that best suits your need, space and budget. Position your garden where it is accessible and you can easily monitor it. If you have a problem with deer, rabbits, and other small animals you may wish to put up a small fence to keep unwelcome visitors out. Do not locate your garden where it will be directly in the wind, as this tends to dry out the soil and damage young plants. Providing the best growing conditions for your vegetables will assure you that your plants are healthy and produce plenty of vegetables. There are several factors that come into play when considering the growing conditions required for successful garden full of vegetables. It is important that you pick a spot to grow your vegetables that receives at least six hours a day of sunlight. While some vegetables do not mind light shade, such as lettuce, most vegetables require ample sunlight to thrive. Vegetables require high-quality, fertile soil that is rich in organic matter. Your soil should also drain well and not puddle after a heavy rain. Adding peat moss or perlite to clay soil will help it to drain. Adding soil amendments such as well-aged horse or cow manure will help increase the nutrient value of your soil. Position your garden close to a water supply so that watering is not a major challenge. Vegetables need to be watered frequently, especially when they are just getting established or when the weather is hot and dry. Drip irrigation is an excellent way to keep vegetables moist at all times. Perennial vegetables include such crops as rhubarb and asparagus, and should be located where they will not interfere with the rest of your garden. Cool season vegetables include those that can withstand the cooler temperatures of early spring and fall. These vegetables include such crops as lettuce, peas, spinach, potatoes kale, cauliflower, broccoli, Brussels sprouts, carrots, beets and onions. You can generally plant these vegetables several weeks before your last possible frost date and in early fall. Common warm season vegetables like the soil temperatures to be warm and should be planted after the last expected frost date for your area. Warm season vegetables include tomatoes, peppers, cucumbers, beans, pumpkins, melons squash and corn. Provide water from planting until harvest, especially when the weather is dry and hot. Keep young seedlings moist and water more than once a day if necessary. Drip systems are ideal for vegetable gardens. A layer of mulch will help conserve water and provide protection for your vegetables. You can use straw, bark chips, or compost. Apply mulch several weeks after planting to allow time for the soil to heat up. If you live somewhere with a very short season, consider a mulch of black plastic as it keeps the heat in and will help to speed up growth. If you apply fertilizer at the time of planting, it is generally unnecessary to apply it again. Use a high quality organic fertilizer. Bone meal is an excellent slow release fertilizer. Heavy feeders such as tomatoes, broccoli, or cabbage may require a follow-up feeding. To minimize damage from pests, plant heirloom vegetable varieties, avoid using synthetic pesticides or traps and consider companion planting. The more you mix up your crops, the less pest damage you will have. If pests become a problem, there are several organic homemade pesticides that will work quite well. Keeping the garden area clean and weed free will also help keep pests at bay. Encourage birds, toads and other beneficial insects into your garden. They will help keep the bad insects away. Enjoying the fruits of your labor is always the best part of vegetable gardening. Pick vegetables when ripe and pick frequently. Handle vegetables carefully and be sure to follow proper storage and preservation techniques to enjoy your harvest for a long time.